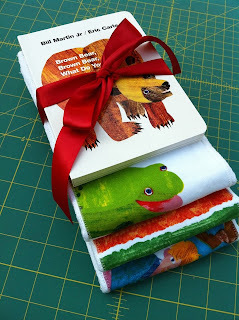 Spicy Pinecone: "Brown Bear, Brown Bear" Book and Burp Cloth Set Giveaway! 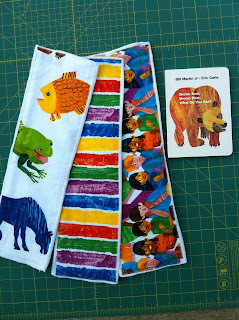 "Brown Bear, Brown Bear" Book and Burp Cloth Set Giveaway! Since I've been busy whipping up a bunch of baby stuff, I thought it would be fun to do a baby-themed giveaway! At our house, the Eric Carle books are a huge hit and one of our favorites is "Brown Bear, Brown Bear, What Do You See?" The prizes for this giveaway are a "Brown Bear, Brown Bear" board book and a set of 3 burp cloths. The burp cloths are made with 100% cotton fabric that is sewn onto Gerber pre-folded 3-ply birdseye cloth diapers. The fabric embellishment extends down the middle of the cloth diaper, leaving white areas on either side for additional coverage for burpy babies. Photo showing the embellished fabric-covered middle of the cloths. The giveaway starts today and ends midnight on the 23rd. See, there actually are some good things that start on Friday the 13th. ;) Open to US and Canada. Those prints are so nice! Super cute burp cloths! Would make an awesome gift!! Brown Bear is one of my favorite books for kids! The burp cloths are adorable! these burp cloths are so cute! Love Bill Martin, Jr. books. Hope I'm lucky! Love the books. I read them to my children and would love to win the board book for my grandson. 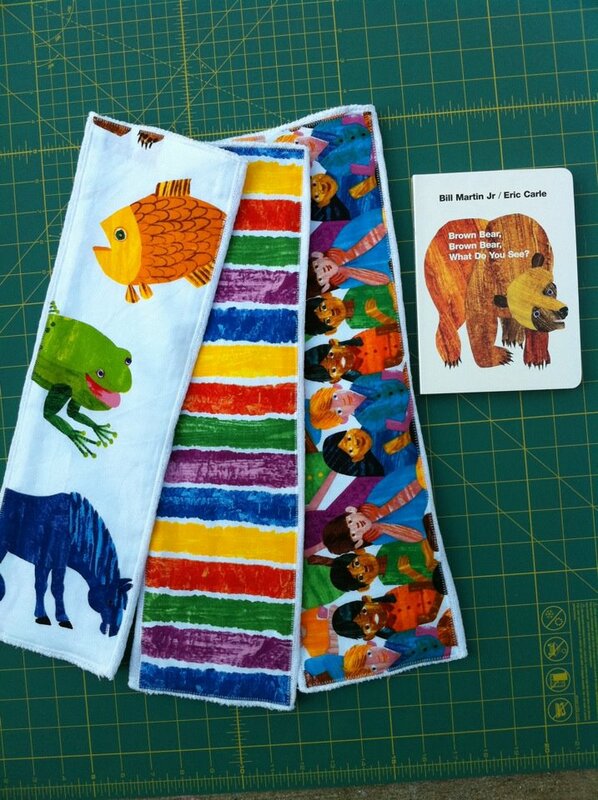 Eric Carle is awesome and the burp rags are so cool! I hope I can win!! My email is lrmouw@gmail.com. I'd love to win these for my nephew. Thanks for the chance. Love this theme. Eric Carle is a favorite around here. My little Julian would love these! I can't wait to read Brown Bear, Brown Bear with him once he's old enough! thank you for the giveaway!! my email is linked to my google account and to rafflecopter. Love the burp clothes. So very cute!! These are really cute burp cloths. I love those fabric prints! We haven't read Brown Bear here, but my little guy loves the Hungry Caterpillar. :-) Thanks for the giveaway! So cute! My son loves Eric Carle, but we don't have this book yet! Cute burpcloths & very handy too. Thanks for the giveaway. Love it! my LO is 2 months now so I can use all the burp cloths and cloth diapers I can get. Cute! I could really use some burp cloths. My baby is going to be born in a couple of months and I have nothing. This would be perfect for one of my friend's nurseries! (Eric Carle theme!!) Thanks for the opportunity! Awesome, my daughter LOVES this book, would like to use these for the one we have on the way! Burp cloths are always such great baby shower gifts to have on hand! These burp cloths are fantastic! Thanks for the giveaway! This is the sweetest giveaway ever! please enter me! My daughter is due with her first daughter in August and she would really love this set! Eric Carle is my most favorite Children's Illustrator!!! My fingers are crossed! Great Giveaway! I love them! How cute! I love the way you coordinate the fabric and the book. Thanks for the giveaway! My friend just found out that she's having a baby, and I'm already planning out a multitude of gifts for her. These adorable items are definitely going to be making an appearance (whether I win the giveaway or not!). Just started following the blog, and made it one of my favorites in etsy! Brown Bear was DD1's favorite book. Hoping #2 will enjoy it as much! Thanks for th chance to win this wonderful prize pack!! These are great! I love the color. These are sooo cute! The colors pop so well!! !